With Super Bowl 50 just around the corner, both date and location, we’re discovering the Super Bowl heritage in California. Over the next week, we will road trip from San Diego to San Francisco exploring the history of the Super Bowl in California. 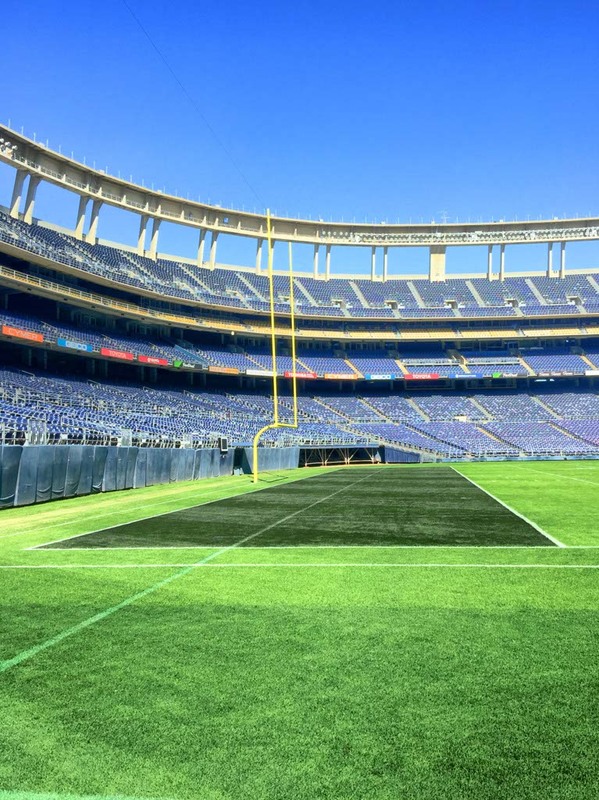 We started at Qualcomm Stadium followed by the San Diego Hall of Champions and we already feel the Super Bowl fever. 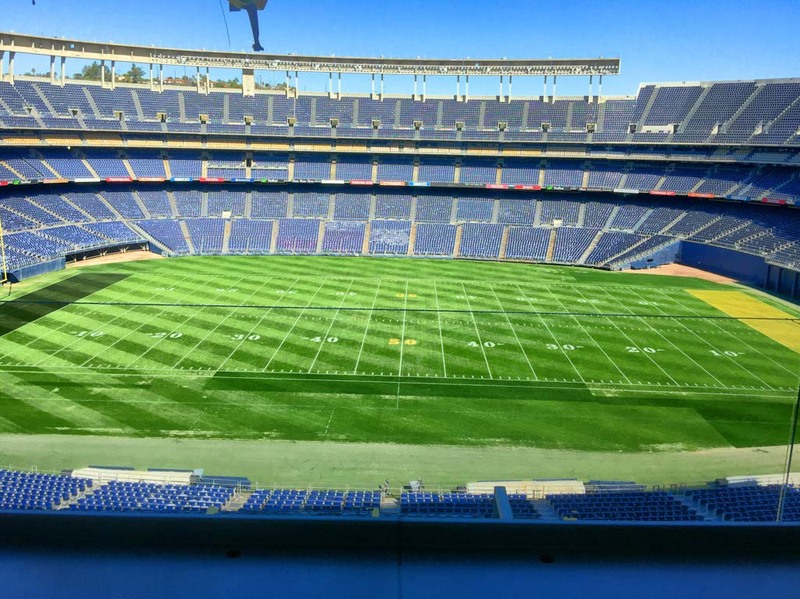 This morning, we had a private tour of the Qualcomm Stadium in San Diego. Qualcomm Stadium has hosted three Super Bowls: Super Bowl XXII in 1988, Super Bowl XXXII in 1998, and Super Bowl XXXVII in 2003. In 1998, It also hosted the Super Bowl and the World Series in the same year. 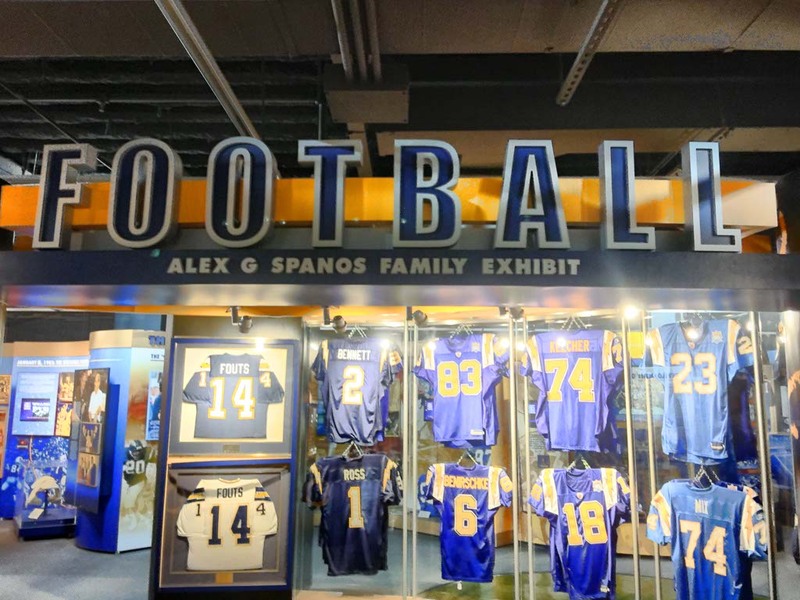 The halls and locker rooms of Qualcomm have seen their fair share of famous athletes including Junior Seau, Philip Rivers, and LaDainian Tomlinson. Also, Lesley and Athena Carter. Since we had the stadium to ourselves, Athena and I ran out onto the field pretending to be players in a game. We made up a touchdown dance and made fools of ourselves, but we were the only ones there, besides the stadium General Manager, Mike McSweeney, so we didn’t have a care in the world. I had never been on a professional football field before. It was huge! I can appreciate every yard gained without even adding the 300 pound tackle coming my way. We had to run the entire field just once to soak up the glory. We soaked it all up including a tour of the locker rooms. Athena hopped up on the table and pretended to be hurt. I was the doctor who fixed her up. We were both kids today. After leaving Qualcomm, we made our way to Balboa Park for the San Diego Hall of Champions. 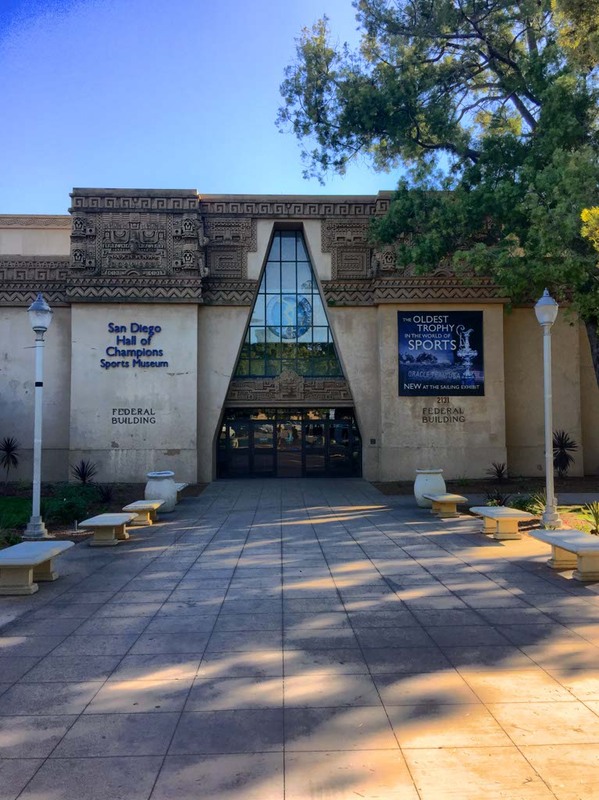 The San Diego Hall of Champions is the nation’s largest multi-sport museum with three levels of memorabilia and 68,000 square feet. The rich history of the San Diego Chargers is featured as a part of the Hall of Champions’ football exhibit. 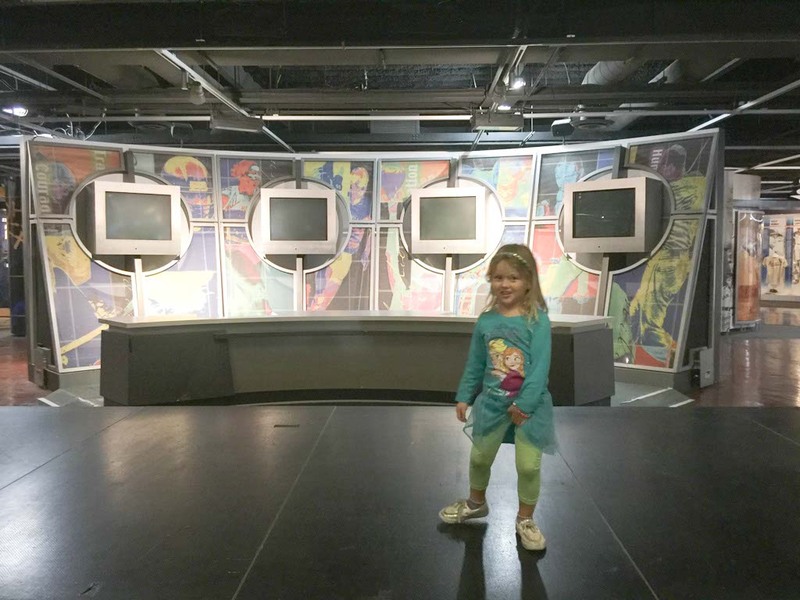 Artifacts of note include one of Sid Gillman’s playbooks, a Lance Alworth game worn jersey, and a 1963 American Football League championship trophy. Athena loved the “costumes” and she enjoyed pushing the buttons and hearing the stories that came from the speakers. We pretended to be announcers at a game as we watched the screen. She’s so creative for a 3 year old. Athena is incapable of passing a stage without putting on a performance so when she saw this one at the Hall of Champions, she had to climb on up. I had to laugh at her robot moves combined with ballet and stomping. The creative of my child is remarkable. Our first day of Super Bowl heritage was a huge success. 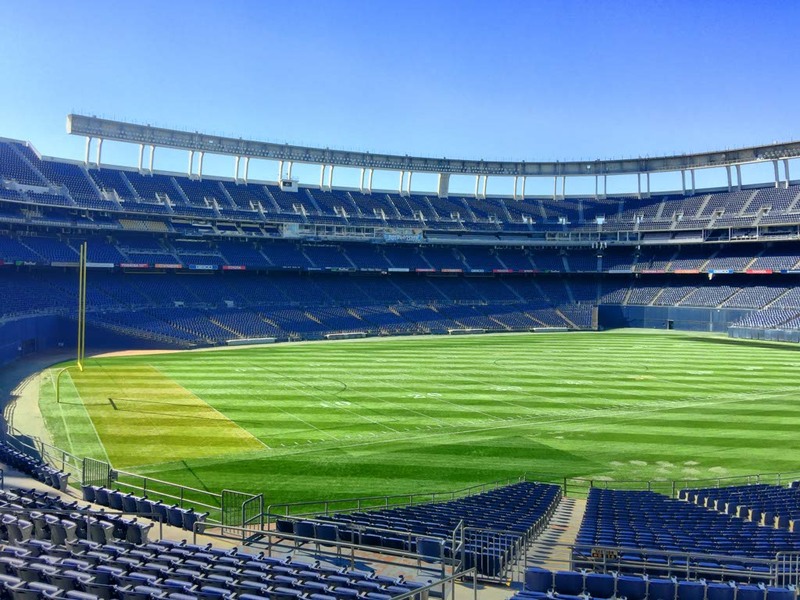 I learned tons of interesting facts and information about the history of football in San Diego and we had an insiders look at the stadium. Tomorrow we’ll make our way up to Pasadena and explore Rose Bowl Stadium. We bought a tiny football from a dollar store and we’re going to continue perfecting our touchdown dance. Stay tuned for footage. 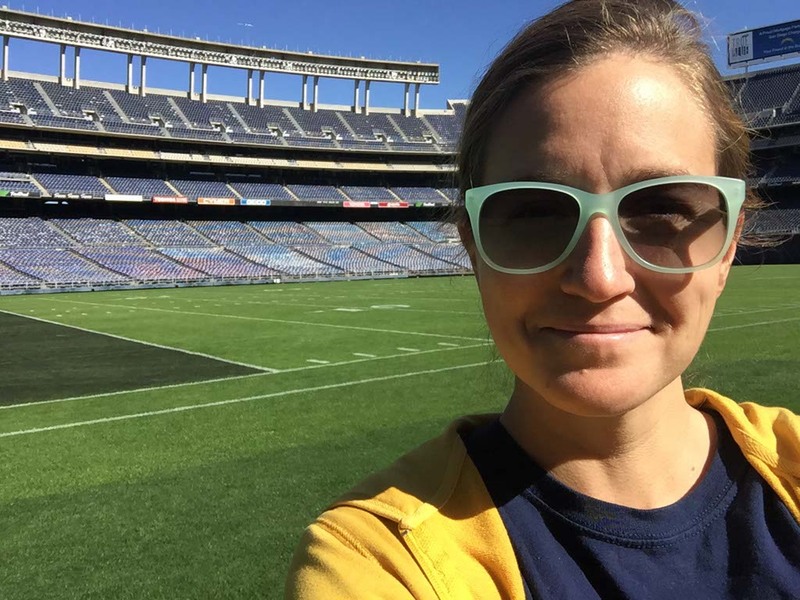 This entry was posted in California, San Diego, Travel, USA and tagged California, San Diego, sports, Super Bowl, Super Bowl Heritage by lesleycarter. Bookmark the permalink. She is such a joy to be around. We could be getting our nails done at the spa or playing on a football field and she is always filled with happiness. I am grateful! She will be four in April and we’re planning a day at Disney. 🙂 Exciting times. Yes, I sure can see they joy in her smile. Sounds like a fun birthday plan for Athena! I’m jealous. It’ll be about 11pm here when I watch the game. I’d love to get the chance to visit like that. Miami Dolphins, been lucky the last two years they have played at Wembley so I watched them there, this year I met a load of the players at the hotel, great day. They chatted, took pictures and signed stuff. Really friendly with the 5-6 of us who were there. Of all the gifts a parent can give a child, you are giving her the most precious one – the gift of experiences! Love it. I prefer experience gifts as well. I love exploring the world with her. 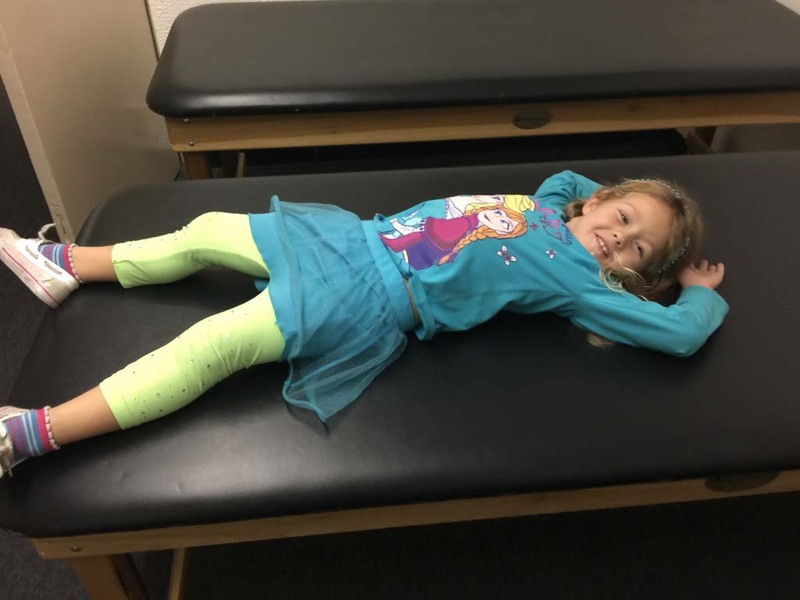 She’s an amazing little girl. Wow, what a fabulous experience for you and your daughter. I recall when our son was about 7 or 8 we signed up for a mini soccer tournament at BC Place (60,000 seat stadium) in Vancouver, where they actually got to play on the turf. Getting to walk/run on the turf is amazing, as during the stadium tours of my team, Rangers FC in Glasgow, before heading down the tunnel to the pitch, they specifically request you do not enter the pitch. Such a fun way to experience the Super Bowl heritage- I’m sure your daughter would carry this memory with her for years to come. I can’t say I am a huge football person or fan. However, I’m sure standing in the field all by yourself sure felt pretty awesome! Sounds like a great experience and your girl seems to be so proud too. 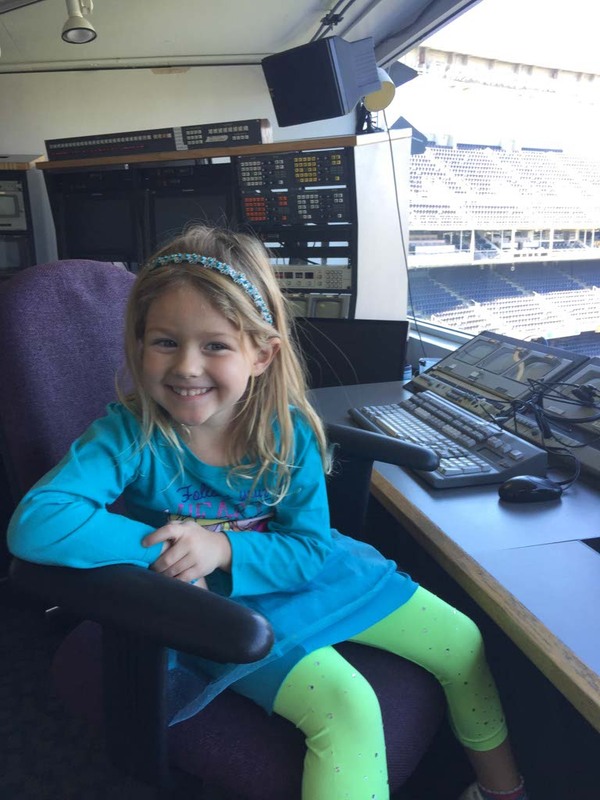 I love getting a behind the scenes look like this–never thought to do it at a football field though–great idea! Looks like a lot of fun. Love that Athena had to put on a show on the stage–too cute! I’m not at all a fan of football. In fact, it’s probably pretty accurate to say I despise it. However, this tour looks really interesting. Plus – it’s in San Diego, so that’s a big plus right there. I’ve been to Balboa Park, but never to the Hall of Champions. Maybe I’ll adopt an open mind and check it out the next time we’re in town! Cool, well a different kind of bucketlist but the super bowl is huge in the US!